Food is a very important element to any great event, festival, wedding or party so we’ve got you covered. When you are in need of a party-sized grill, Varsity can help. 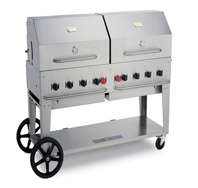 We offer our clients the best 5′ grill on the market, a Crown Verity. A quality product to help ensure that you get the job done right. Our grills can cook up to 420 burgers or 350 NY strip steaks at a time. Features: 129,000 BTU’s, a cooking surface of 58″ L x 21″ W, 8 burners, and roll dome lids to keep the heat in. Rental Information: Barbecue only. Propane not included (100 lbs tank required).